What does it mean to live? It’s a peculiar question because we all seemingly know the answer. For me, it’s hanging out with my family, writing anime reviews, and going to work. When it’s deconstructed into its base parts, my life really does sound “simple.” But in actuality, it’s complex, filled with events and happenings that shaped the very course I took. And it’s not just my life or anyone else’s, but the people within it that are complex, too. We’re an amalgamation of various emotions, ideals, and feelings that cannot be explained so easily. 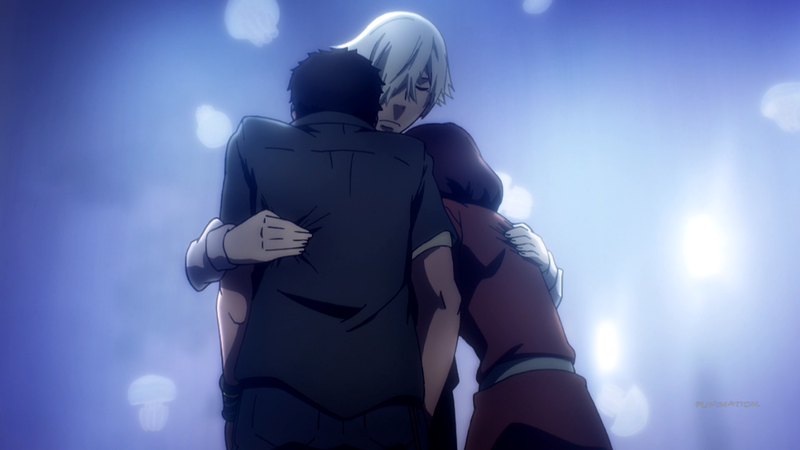 Death Parade demonstrates this very concept, providing the audience with a marginally successful outing. 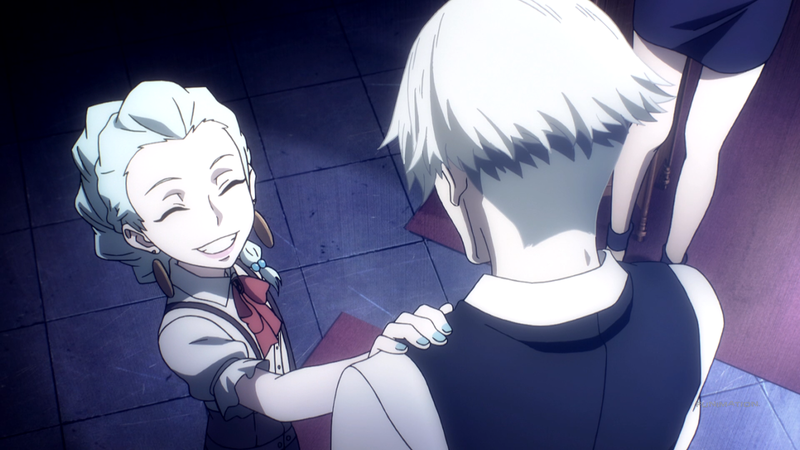 Death Parade begins with Decim, known as an “arbiter,” who seemingly tests people to determine their soul’s worth. His assistant, a girl with no name, helps him during the process, and together the duo sees their many games unfold. One of Parade’s (the shortening of choice) strongest aspects is the theme it tackles. Said theme was just previously introduced: humanity’s complexity and emotional depth. For while the anime is called “Death Parade,” it is not an anime about death. Instead, it utilizes death as the literal playground in which to explore the idea its set forth. In order to do this eloquently, the anime essentially takes two people who hold either a direct or indirect relation and pits them against one another in a game. As these games play out and the series progresses, what we see is how deplorable we can be. Jealousy and betrayal caused through physical cheating, revenge against those who were wronged, mistreatment caused by misunderstanding; people are painted in a bad light on many occasions, making it hard to deny that we are quite vile when we want to be. But at the same time, the games showcase our goodness: coming to terms with a long lost relationship, being content with the life one has lived, and sacrificing ourselves to save another prove that people can, in fact, do what is right. This is what Parade nails down pat, the notion that both life and people are not extremely dichotomous, but instead a mix of the two sides. Trying to define someone for a single, arbitrary event sometimes works and sometimes doesn’t. The difficulty lies in the fact that everyoneexperiences highs and lows. So it comes down to how you truly feel, deep down, that matters. For some of us, it might be too late before we realize this message. But even then, and with a little luck, we all get one more chance to convey our very selves. While Parade’s thematic presence is strong, the rest is sadly not. Part of the problem, oddly enough, comes from itspremise. The people being tested are required to play a singular game that varies per coupling – bowling, arcade machines, air hockey, cards, etc. – in order to bring out everyone’s inner workings. The games themselves, in comparison to the rather mature nature of the anime itself, are silly and don’t quite “fit” within the confines of the show. In an attempt to alleviate this issue, the anime incorporates each game with a sense of “urgency,” usually affecting their bodies in some way. For instance, Twister uses the elements to mess with the contestants whereas bowling lets one person “feel” the heart of the other. Unfortunately, such an inclusion only serves in hindering the show itself by forcing the games to become repetitive. The games usually go through the exact same process: people show up confused, they start playing, memories are relived, and the conclusion is reached. Every episode is structured in this way, except the final two involving the no-name girl. Her trial was the only shining example because it wasn’t a game, and instead utilized the atmosphere, world, and purpose it was trying to get across. And on that note, Parade continues to fall short in two further areas: it’s world-building and in the drama it injects. 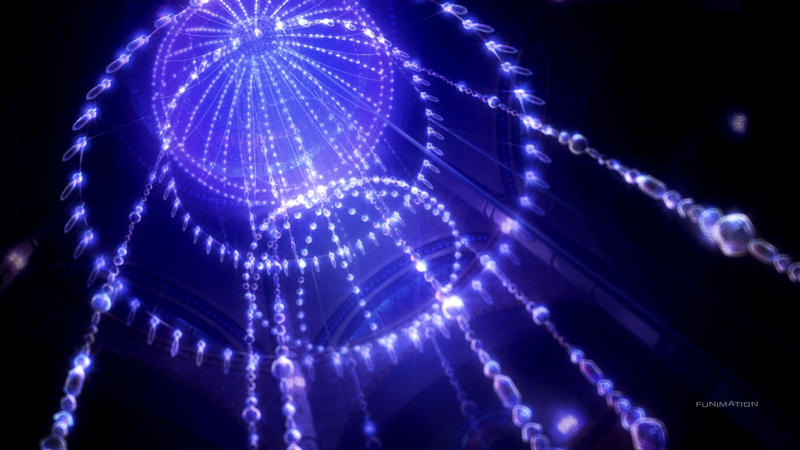 Much of the setting, besides Decim’s bar and the games, is given zero context. The show goes out of its way to give the audience quite a few different areas of the afterlife to look at – the void and reincarnation, Nona’s abode, the memory factory, the worldview of death, etc. – but none of what’s presented is given any sort of explanation besides a single line or a passing frame. Meaning much of the anime’s rules and setting is muddied in obscurity. Now, this may be the point; that we, as “the living,” aren’t technically supposed to learn how it all works. But even if that’s the case, having improper world-building, especially in an anime that relies on its atmosphere, is more a detriment than a boon. The worst offender of all, though, is a product of the episodic format and the lack of environmental investment: the people being tested aren’t relatable. This isn’t in the sense that they’re dead and therefore we, being alive, can’t comprehend such a situation, which may be the case. It’s more so that, moving from one couple to the next gives us no time with which to care or connect with the people on-screen. This applies almost as equally for Decim and the no-name girl. Their near constant involvement throughout the anime gives them a small leg up, but since they’re only focused on near the end, there isn’t enough material to make their story anymore worthwhile than the other people who came through the bar. Parade visits reincarnation when it comes around to its art and animation, hitting it out of the park and then some. 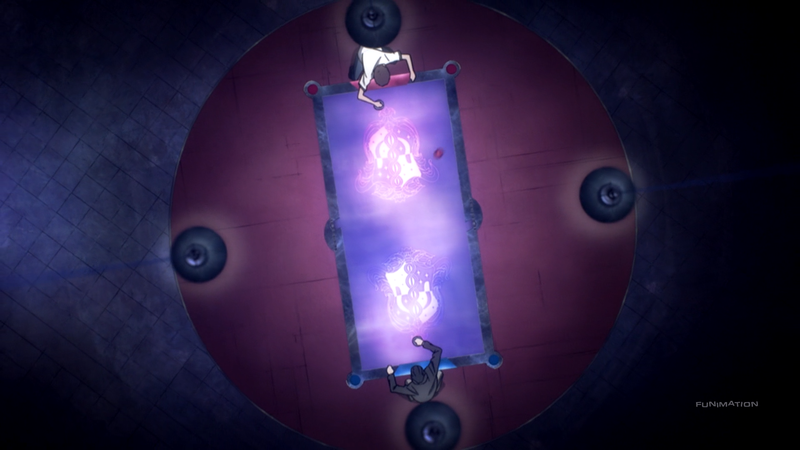 A lot of the anime takes place at Decim’s bar, as has already been discussed. But even his “home” alone is a marvel to look at. As are most of the other spots: Nona’s house is eerily calm given its barrenness and lighting, Oculus’s billiard table is galactic, and the no-name girl’s room is refined yet mysterious. The detail that Madhouse puts into each of its backgrounds is heavy, with nothing being left untouched. Furthermore, instead of the premise hurting the show, it uses it to its advantage; by investigating the minds of the people, the show is able to concoct any number of areas with which to look at. A mountainside road, a familiar home, a dark forest; the show is able to carve its style into reality as well as in their pseudo-life location. The character designs see the same, impressive treatment. The arbiters unanimously have cross-shaped eyes, but each is still rather unique in their presentation. Decim’s plain white hair mirrors his emotionless status; Nona’s suspenders, weaved hair, and small stature are “fun” but contrast her stalwart convictions; and no-name girl’s sharp face is accentuated by her streaking black hair containing a strip of white that symbolizes the last bit of herself she needs to be “complete.” They’re all exceptionally well done. Actual animation is no different from the rest; it’s constantly above average no matter what the show is doing. Everything from the characters’ facial expressions to their overall movements while playing the separate games is, like the art, always given high attention. There are essentially two characters of Parade: Decim and, named much later, Chiyuki. The remaining, “known” cast is barely given any focus, making their inclusions pretty pointless. Decim is known as an “arbiter,” or someone who brings about judgments to the people who make their way to the afterlife in order to determine if their soul should suffer or see serendipity. He’s unique among the other arbiters not just for his propensity to craft human-like dolls after the people who visit him but also due to the human emotions that he has. Arbiters aren’t given such emotions since it supposedly incurs unfair bias. But this is what allows Decim to learn the same theme that the audience learns as well. And that’s humanity’s unending complexity. Early on, we see him make mistakes or go about judgments in a “by the books” manner. As the series progresses, and guided by the half-arbiter Chiyuki, he starts to realize how people aren’t necessarily evil from just memories and word of mouth. He actively seeks to understand what makes people who they are, instead of staying ignorant like his counterpart Ginti. His fascination with humanity eventually leads him to perform a judgment unlike any other, and thereby causing him to experience what all death brings: suffering. His creation is initially kept secret, later on questioned, but ultimately made known and accepted. All because Decim proved that humans are more than just dolls; they’re people. The other star is Chiyuki and, similar to Decim, is unique in the status she holds. It’s revealed later on that her memories were “reset” and that her time with Decim was simply there to get her primed for her own judgment. But with this tiny tidbit, it becomes apparent that Chiyuki reflects Decim’s person. That is, besides him gaining (emotions) and her losing (memories), and besides him being an “arbiter” and her being a “doll,” the two hold opposing viewpoints. Decim wants to understand other humans whereas Chiyuki feels we cannot understand each other in the first place due to our inherent complexity. While it occurs more or less at the conclusion of the series, Decim has Chiyuki come to the realization that it’s precisely because of such complexity that people can understand one another. In other words, since we all experience the same emotions and feelings, we all deep down “get” one another. And through her own self-actualization and subsequently saving, Decim is saved, too. Thus Chiyuki departs, remaining behind as a doll beside Decim and as a good memory in his heart. Arguably Parade’s strongest facet is the opening theme. It contrasts heavily with the rest of the anime’s tone, being extremely lighthearted and fun. The catchy English lyrics, vocal range singing, and disco beat make it a musical score that anyone, alive or dead, will always remember. The ending theme, however, ditches not only the happiness but also the impact. It’s an alright piece that is filled with a mashing of instruments and drowned out singing, whose only real highlight is the dreary feeling that it gives off. The rest of the soundtrack usually involves laidback pieces during “downtime” or more grating tracks during the tenser moments of the anime. One arrangement in particular involves a sort of back-and-forth beat with accompanying violins that feels like the very games that are being played. There are sad tracks and more uplifting ones, too, that fit the mood, but nothing entirely engaging or worthwhile for later listening. Voice-acting sees rather nice performances from most of the cast, including the episodic characters that appear. 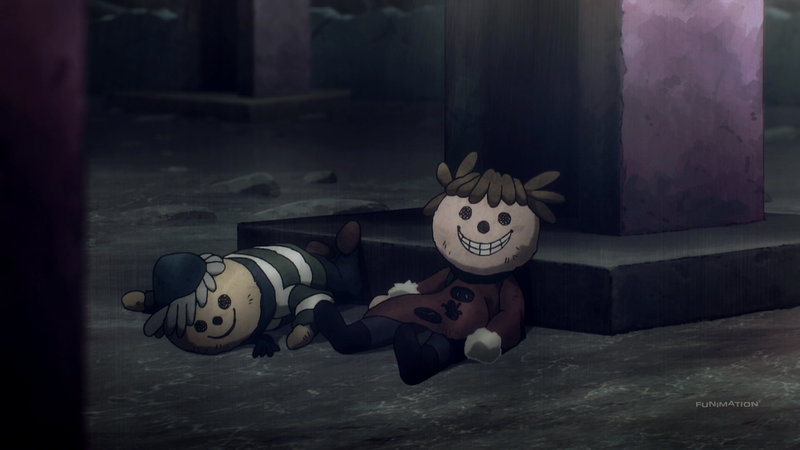 Special shout-outs are in order for Rumi Okubo as Nona for her peppy yet stern way of speaking and Tomoaki Maeno as Decim for his uncharacteristically deep voice. The show’s format doesn’t lend itself well, at all, to making someone like me invested in the characters being targeted. As such, I was never really moved by any of the situations that these people found themselves in. There’s a lot of crying, a lot of screaming, and a lot emotions being thrown around, but none of it ever stuck because I wasn’t able to truly establish a relationship with any of the characters on-screen. Regardless, the actual concept is still pretty interesting even if it doesn’t execute everything as well as it could. Learning to understand one another is something that I value, for it not only makes the relationships I hold with others stronger but also influences others into holding the same kind of thinking. So while the show didn’t strike any chords in terms of comedy or drama, I most certainly appreciated the direction it took. 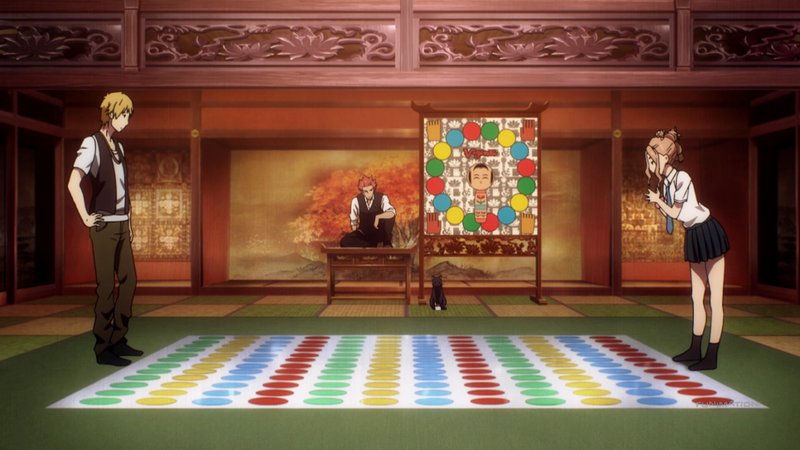 While life after death is unknown to us all, Death Parade tries its best to provide us with the answer. Its narrative is bogged down by multiple issues, and its cast is rather average, but the nice themes, the superb quality of the animation, and mood-fitting music work in its favor. If anything, this one demonstrates that death, like life, is quite the complex entity. > Another good review, 2 for 2. > …and he actually showed the process of deductions a little which is a touch most anime miss. I did enjoy the show taking the time to vary up the people and scenarios. Doing so allowed them to properly explore the many sides to the complex shape that is humanity. > Also that they alluded that both were sent into the void at the end was the cherry on top. Will do, and thanks again for the positive words!